as much as i'd like to, i just can't let this day pass without recognizing what this day could have represented. today was the due date for our fourth baby. the baby that we discovered was lost during my 16 week check-up. i'd be lying if i didn't say that these last five months have been etched with a lingering ache. and usually at the most inconvenient times. BUT, they have also been filled with a lot of compassion, hope, encouragement, and kindness. many times i have had to step back in awe as i experienced the little tender mercies people have been a part of. people willing to ask how i'm doing at a moment when i really needed to talk, others sending a random gesture my way that was very MUCH needed at that moment. or, those able to just recognize situations that might be difficult for me and offer a shoulder. i hope i can remember to be this kind, thoughtful, and concerned when i know someone is hurting. more times than not, i believe these people were receiving inspiration from our heavenly father. so thankful they were listening and willing to act on that little whisper. thank you for the examples and opportunties for growth. our heavenly father is so very mindful of each of us. it's amazing! the joys of a slanted driveway. saturday night our friends invited us to their stocked pond to do some fishing with the kids and have a bbq. our kids were SO excited! and it didn't disappoint. they each caught a few and the weather was great. thanks for the fun simmon's family! i told him to hold the fish and this is what i got. he's got a little TOO much of his mom in him. wesley was great at casting his line. wesley reeling one in. he caught FOUR that night. this is as close as he got to holding the fish as well. madalyn even reeled one in. then she was SUPER ticked off when we let her fish go. 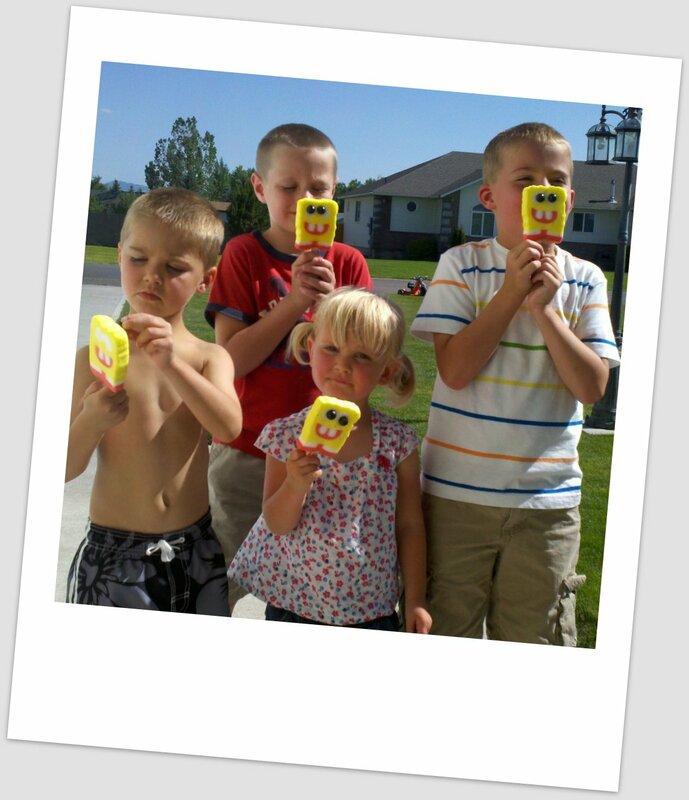 the ice cream truck came through our cul-de-sac the other day and all the kids went running for their piggy banks. i thought these sponge bob Popsicles were hysterical. they had a cute crafting house that the kids could go and pick a craft to make. they chose to color a bag to put their gold in and also made arrow head necklaces. on our walk to the zcmi candy store we were stopped and asked to wait while a hand cart group walked down the main street after a return from their trek. it was pretty neat! they were also firing off a cannon near by so they taught us how to avoid hurting our ears. it was so touching watching this all take place. the "towns people" greeted them with cheers, shooting guns in into the air, and shouting "huzzah! welcome to zion!" i teared up. owen insisted on getting a picture with these men. he makes things so fun! our family in front of the heber c. kimball home. then the boys were able to have a quick pony ride. we picked up a few souvenirs at the zcmi candy store. owen and wes both got a bear claw. we were able to spend the rest of the evening with kevin's family enjoying the nice weather and company. then, spent father's day with them as well. it was a nice relaxing day for kevin. and it was nice to spend it with fred. the main reason we planned our vacation when we did was so that we could attend the annual heber c. kimball reunion. heber c. kimball was one of the original twelve apostles in the restored church. kevin's mom is a descendant of heber c. kimball and they put on a great reunion every year at "this is the place" park in salt lake city. the reunion went from 11-2 but we were able to stay as long as we wanted. we thought that by 2 we would be more than ready to leave. but, we were wrong. we stayed until after 5 and had a great time. during the program portion of the reunion they had a couple dressed as vilate and heber c. kimball. they read some letters the two had shared. it was very interesting to hear. vilate was heber c. kimball's first wife. he later married forty-two more women as he practiced polygamy. they also had a raffle with lots of prizes for kids and adults. wesley won this bubble maker. he was so pleased! after lunch and the program we ventured off into the old fashioned town they have in the park. it proved to be well worth our time. the kids LOVED it! we rode the trolley that gave a quick tour through the town. the we hopped on the little train that drives you around a pond and provides a great view of salt lake city. then we panned for gold. we did this for quite awhile. everyone was really enjoying themselves. and then it was off to the bank to turn in our gold for candy. we took our first vacation of the summer last week. kevin took thursday through sunday off and we headed to utah for a few days. it was so nice to be able to get away all together for a few days. since it WAS father's day WEEKEND (bet you didn't know the dad's get a weekend) we sent the men to buffalo wild wings restaurant for THREE HOURS to watch the nba finals game. they had a good time there. and in the mean time, the ladies and kids enjoyed pizza and water in emily's backyard. the weather was beautiful. my sister, melissa, and her boys even came to join us for awhile. 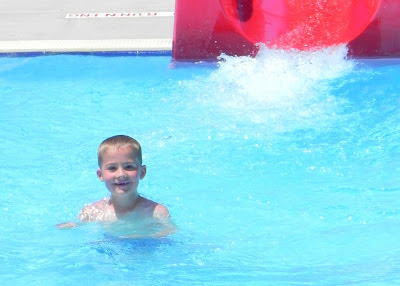 we spent the next afternoon at the american fork recreational pool with the Hanson's and Murdoch's. 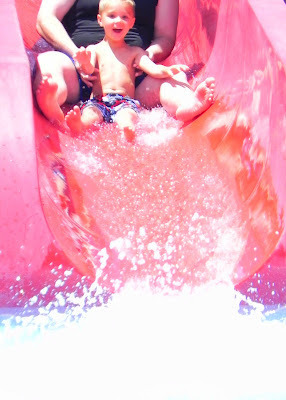 the kids had such a great time going down the slides and playing in the water with their cousins. everyone of the kids loved this water slide. i went down it once and got a little sick climbing the stairs. i guess i don't do heights (let's add that to my list). i didn't have my timing quite right on this picture but i did catch wesley's excited face. 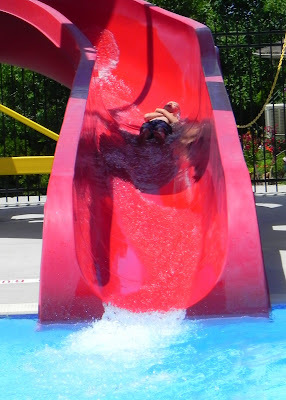 yep, even madalyn begged to go down the slide again and again. i can't believe how big she is getting. maddy was able to bond a little with her aunt melissa. it made me smile. oh, that little face! how can you not smile? SISTERS! it was so fun to enjoy some down time with two of my sisters. after some water fun the boys continued their weekend with a round of golf. the ladies took the kids home for some quiet time. then brandon treated us to some dutch oven chicken and potatoes for dinner.